BNI Urban Professionals is a marketing group in Vancouver, B.C. that specializes in word-of-mouth referrals. BNI’s proprietary business networking strategy, allows one person per business specialty in each chapter. In it’s simplest form, your fellow BNI members carry your business cards. When they meet someone who could use your product or service they pass along your card and share testimonial information about you. It’s like having a team of sales people working to promote your business. Successful business depends on word-of-mouth referrals. BNI’s unique approach offers a cost effective form of referral generation. 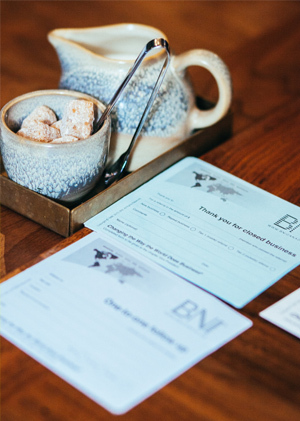 BNI’s structured system of giving and receiving referrals creates a supportive and trusting environment for developing serious business relationships. The relationships you develop will convert network contacts into referred business. Take the opportunity to substantially increase your business through referrals.